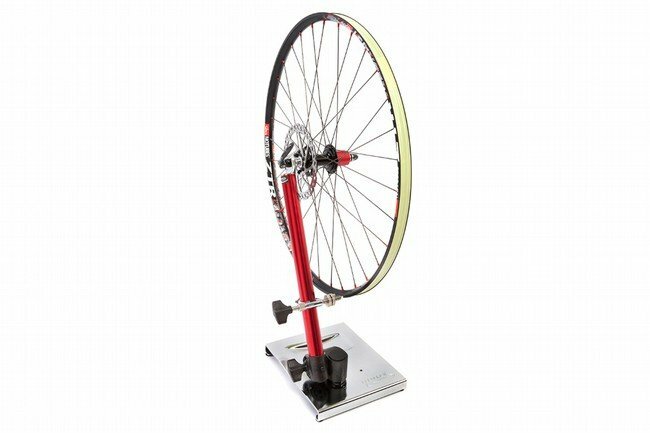 Feedback's Pro Truing Stand is the complete package for wheel maintenance. With its single arm, this truing stand allows unrestricted access to the wheel for any necessary work, and this construction also makes dishing a breeze by just flipping over the wheel. Vertical and lateral truing is made easy using the sliding spring tip indicator, which also has an integrated disc brake truing slot. Compatible with wheels up to 29", even with the tire installed, and equipped with adapters for 15mm and 12mm thru-axles, makes this a very versatile stand. The Pro Truing Stand comes with a stable base and 15mm and 12mm thru-axle adapters. Truing arm also can be attached to any Feedback repair stand. If you can afford it, just get the Park stand. This one isn't even worth the money, cheaply made and rather fragile in comparison to Park's wheel stands. Mine arrived in pieces, even though the packaging was intact and undamaged. It didn't even survive shipping, so how long is this tool going to last? Other than that, adequate I guess. very sturdy and precise easy to use truing stand. Plastic spring loaded indicator will not scratch wheel surface and rotor indicator works nicely. comes with 12 and 15 mm thru axle adapters which are easy to use. I needed a wheel stand to help make gluing tubular tires easier and out of the choices this stand stuck out, I wanted it to be small, light and easy to use and the feedback pro fit the bill. I think the Park Tool stands might be a better option if you are going to actually build wheels but for maintenance it is more than enough. I was a little concerned it may not be sturdy enough but when the wheel is attached its very solid, perfect for checking and adjusting wheel alignment but most important to me with the way the arm easily moves around its perfect for gluing, with a skewer in each wheel its literally 1 second wheel out, 1 second wheel in so I dont hardly miss a brush stroke..
works well for the occasional truing. easy to use and sets up quickly. was a little concerned about single arm and wheel holding capabilities - but hasn't been a problem. Just what i was looking for. I like how versatile this stand is. Works with quick release and thru axle wheels, and has a feature to help true up disc rotors, which is super helpful.